How can half gauge guitar strings help you achieve more even tension between different guitars, and better balance the tension on each individual guitar? Let’s find out! Want to try a set of Half Gauge Guitar Strings? We’ve got a TON of awesome options to choose from. Check them out right here. What’s up, everybody? I’m Scott from Stringjoy Guitar Strings and today we’re talking about half gauge guitar strings. You’re probably used to seeing gauges like 9s or 10s or 11s at your regular music store, but it’s a little bit less common to see gauges like 9 1/2s or 10 1/2s or 11 1/2s. Well, today we’re going to talk about what’s good about them, what they can be used for, how we use them at Stringjoy, and how you can use them to better dial in your particular rig—how your guitar sounds and how your guitar plays. The first and probably the most widespread usage for half gauge sets are for players that feel like they’re always bouncing between two different gauges and neither of them feels perfectly right. If you like 10s on a lot of guitars, then you switch to 11s and they feel just a little bit better but maybe a little bit too heavy, a set of 10 1/2s will be perfect for you. Same goes if you switch between 9s and 10s a lot. I find 9 1/2s have a lot of a fuller tone instead of 10s with a lot of a flexibility of 9s, so very much they can be the Goldielocks set in between those two different sets that feels just right and has a lot of the great aspects that you like about each one. Now my personal favorite way to use half gauge guitar strings in a way that I think a lot of players aren’t quite as hip to as they should be is to account for different scale lengths of different guitars. Traditionally, Gibsons have a 24 3/4-inch scale length whereas Fenders have a 25 1/2-inch scale length. It’s not an enormous difference. It’s not like a 27 inch baritone or something like that, but it is enough to make a difference in how the guitar plays. If you take a set of 10s right now and throw them on a Gibson and a Fender with standard scale lengths and play them side-by-side, you’ll notice the Gibson has quite a bit less tension on it and the Fender has quite a bit more than the Gibson does. So to account for that, a lot of guitarists will go with a lighter gauge set on their Fender style guitars or other longer scale length guitars, and a heavier gauge set on their Gibsons. So typically they’ll do 10s on the Gibsons and then 9s on their Fenders. The trouble with this is that you end up overcompensating a bit. We’ve done the math plenty of times and it always ends up being that when you make this jump, it’s so much that your Fender ends up with quite a bit less tension than your Gibson, and your Gibson more than your Fender, and they don’t feel just right the way you want them to. Half-gauges are great for this because they give you just enough of a difference in tension to account for that 3/4-inch difference in scale length. So in practice, if you like a set of 10s on your Gibson, and you want your Fender to sound and play a lot like it, just go with a set of 9 1/2s. It’ll almost perfectly balance out and compliment the difference in the scale length such that you have two guitars that play and feel really, really similar. So the trick is whichever scale length is longer, for that guitar you’re going to want to go with a half-gauge lighter of a set. So to be honest, even though I know what this is and why this is, when I was recording this video I had a really hard time getting the longer and lighter straight. It’s really easy to mix up, so if you have trouble with that, just remember longer means lighter. In general, I would recommend this trick for guitars that are anywhere up to an inch difference in scale length. If you get more than an inch difference, you’re going to need a more serious adjustment and we’re always happy to help out with that if you have any questions. Just so we’re clear, I’m not saying that all of your guitars need to have the same tension. I personally like to have very different sets on different guitars. I find that it helps me get a different feel out of each guitar, which I think accentuates my playing, the personality of each different guitar. So don’t think I’m saying every one of your guitars needs to feel the exact same, but if you are a player that really likes your guitars to feel the same, half gauge guitar strings are a great way to help you get there if you have different scale length guitars in your arsenal. Here at Stringjoy, one of our favorite ways to use half-gauges is to build better-balanced sets of stings overall. So typically a set of light electric guitar strings, you’ll see 10, 13, 17, 26, 36, and 46 as the gauges. We’ll do a whole video talking about this in depth, but for today’s purposes, we’ll talk about the plain strings. Ours go 10, 13 1/2, and 17 instead of a regular 13. The reason we do this is because a 13 has quite a bit less tension than the 10 or the 17 on the other side, but a 14 would have too much tension. So it’s kind of hard to pick between those two. Turns out a 13 1/2 is perfect. It aligns all those strings in terms of tension such that when you bend any of them, they’ll require the same amount of tension to bend as either of the others. Honestly, this is been a bit of an advantage for us as a newer string company. A lot of the other companies that have been around for a long time, they had to build their sets back when things like half-gauges weren’t really easily available, so they had to pick what they thought would work best at the time. And it’s been decades and decades with their gauges being the same, they don’t really want to change them. Honestly, there’s a lot more risk there than there is reward. But for us, since we’re a little bit newer, we got to build out all of our sets when all these things were available, so we were able to truly choose the best string for every single position and every single set that we sell. Now the other big advantage of half gauge guitar strings for you as a player is when it comes to customizing your string set. 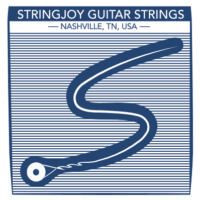 So at Stringjoy we actually started as a custom shop, enabling players to pick every single gauge in their set, and we still offer that functionality on our site stringjoy.com at no extra charge. The trick is when it comes to half-gauges, you can make very small adjustments, very refined adjustments to any string in the set really easily. So if you play a set of 11s and you feel like you just need a little bit more tension on the very first string, go with an 11 1/2 and keep everything else the same. Or if you play 10s and it’s the same story, go with a 10 1/2, or jump down to a 9 1/2 if you want a really bendable first string. Whatever it is that you want to do with your set, half-gauges just make it all the easier to get there by carefully refining exactly what gauges are in your particular set of strings. So I hope this has been insightful and you’ve learned a little bit about half gauge guitar strings strings, what they’re good for and what you might be able to use them for to better dial in your particular rig. With all things strings, the trick is to always keep evolving, keep trying different things, because it can push you a little bit further as a guitarist. I always find that a small change in string gauge, even if it’s a half-gauge, can cause me to play the guitar a little bit differently, see it in a slightly different way, and a lot of times that can spark some new creative ideas. So what do you think? Has this inspired you to try a half gauge guitar strings set for yourself? Are you happy where you’re at or do you want some help picking out some gauges that will be perfect for you? Leave a question or comment down below. Be sure to like this video and also subscribe to our channel so you can keep up with more great stuff like this in the future.